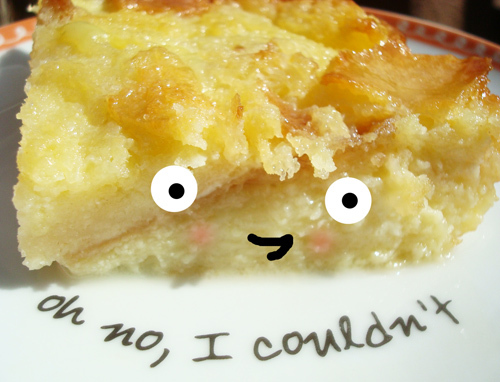 I like bread pudding. But usually, "like" is about as far as my affection goes. I like it. I'll eat it. 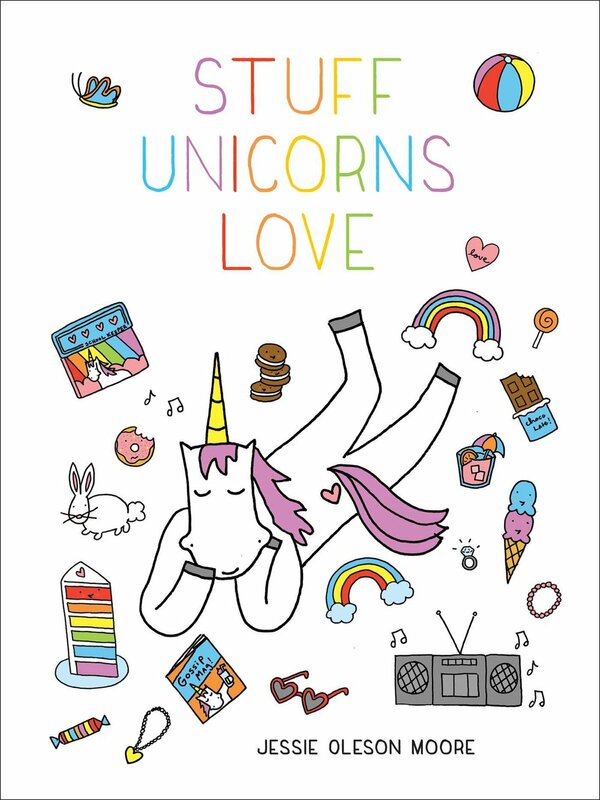 But I'm never like "yeah! 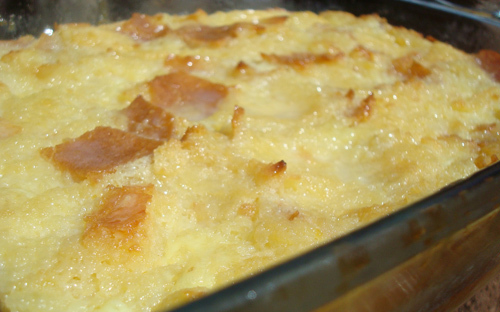 Bread pudding!" and happy dancing about it or anything. That changed when I tried bread pudding in New Orleans. I said to myself, "they get it here, man. They really get it." 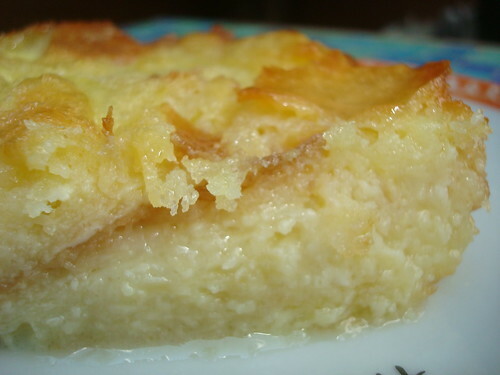 The texture is not so much like custardy, soaked bread as it is like velvet. It's so smooth. And they put this sauce on it which is as addictive as I imagine crystal meth to be. At just about every establishment at which I sampled bread pudding in New Orleans, it was one of those situations where I was like "OK, I'll have a bite" and then ended up eating the whole thing and scraping the spoon on the bottom wanting more. Upon inspection of a variety of recipes and talking to bakers from the area, I think I've pretty much figured out the secrets behind the bread pudding success in New Orleans: they basically double the butter, cream, and eggs, and add booze besides. And the results are stellar. I'd like to try as many of these New Orleans bread pudding recipes as I can. Will you taste along with me? First up is the White Chocolate Bread Pudding from the Palace Cafe. It's owned by Dickie Brennan, a famed restaurateur in the area. This recipe intrigued me, quite frankly, because I had a lot of white chocolate on hand. I'll tell the truth: I made some changes. First, I halved the original recipe. I just didn't have 15 eggs on hand, and it seemed like it would make more bread pudding than two people needed in my household. Halved, the recipe worked great. The texture is like butter. 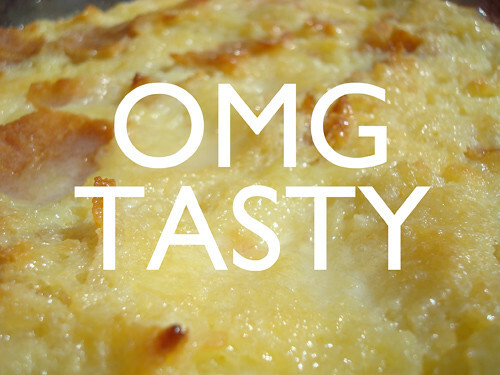 It's so soft, and so moist, it practically oozes like a tres leches cake. This is probably owing to the glaze. It seems like an obscene amount of liquid at first, but somehow the bread pudding absorbs it all. 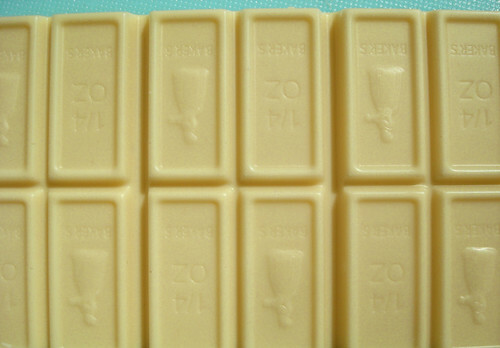 The white chocolate tastes wonderful with the dash of bourbon I took the liberty of adding to the recipe. Actually, after a few bites, everything in the world looks glorious. Cut the bread into 1-inch cubes. Divide it in half--you'll definitely use half, and you might use some of the rest of the cubes. If you don't, you can make croutons, yo. Place the half you're using in a large bowl. Set to the side. Preheat oven to 350 degrees. Grease a 9x13-inch pan. Set to the side. 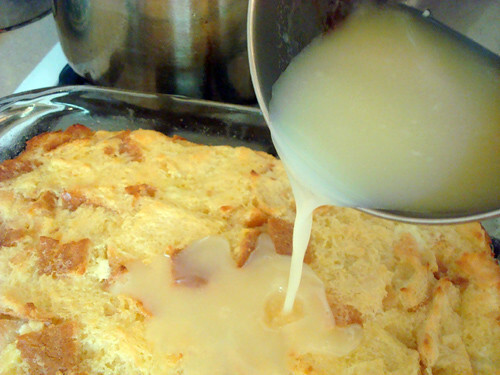 In a large saucepan, heat the whipping cream, milk, and sugar over medium heat. Dash in the salt. When hot, take off the heat and add the white chocolate pieces; stir until melted. Combine the whole eggs and egg yolks in a large bowl. 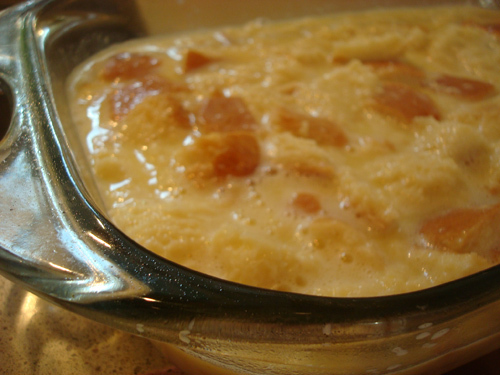 Slowly pour the hot cream mixture into the eggs in a steady stream, whipping the eggs as you pour. If you wanna, add that glug of bourbon now. Add the mixture to the bowl with the bread pieces. If the bread is positively swimming, add some more bread until the bread is covered, but not by much. Feeling good? Now, transfer it to the prepared pan. The cubes of bread will poke up but it's really liquid-y. Using a spatula press down the bread so everything is absolutely saturated. Bake for 40 to 50 minutes, or until set and golden on top. You don't want brown, just lightly golden. While it bakes, prepare the sauce. Bring the milk to a boil in a small sauce pan. Take off the heat and add white chocolate; stir until smooth and completely melted. It's going to be a fairly liquid sauce. 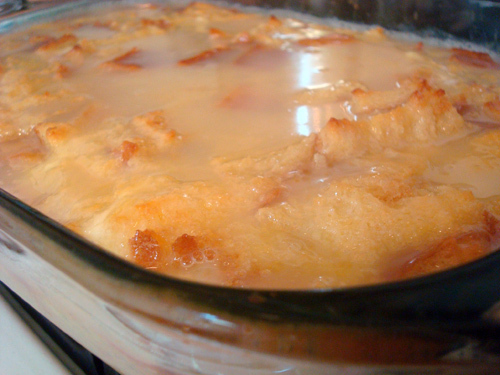 Pour over the bread pudding right when it comes out of the oven. 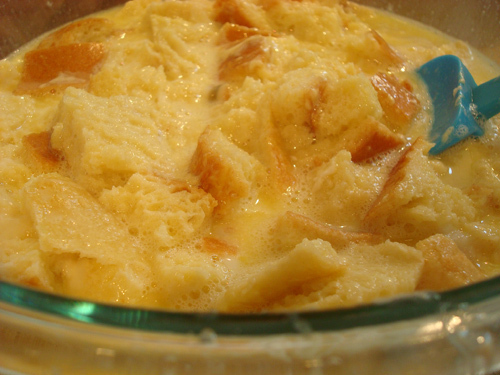 It may look like an obscene amount of liquid but the bread pudding will absorb it. Let cool and enjoy. Store leftovers in the fridge for up to 2 days.